What the New Order Seeks, Reginald Must Find. The new vampire president and his psychotic right-hand man have been playing a dangerous game with the humans over the past six months. In the public eye, the two races appear to be at peace … but the situation below the surface is hot enough to boil. And while the untrusting humans mass their defenses, vampire armies have been building to match them — with plans to exterminate the planet's current inhabitants, saving only a handful of blood slaves. Reginald, Nikki, Maurice, and the others bunkered in at Maurice's estate find themselves in the middle of a no-win scenario: Is it better to fight with their own kind in the vampire revolution? Or should they turn traitors — and risk extermination by the angels — in order to protect the humans? But just as the cold war outside is about to turn hot, Reginald's ever-expanding vampire brain reveals the existence of an artifact that could predict the outcome of the coming war … and maybe even a way to stop it. The only problem is that nobody knows where the artifact is, and when war then breaks and mass slaughter begins on both sides, it seems that time may have run out. 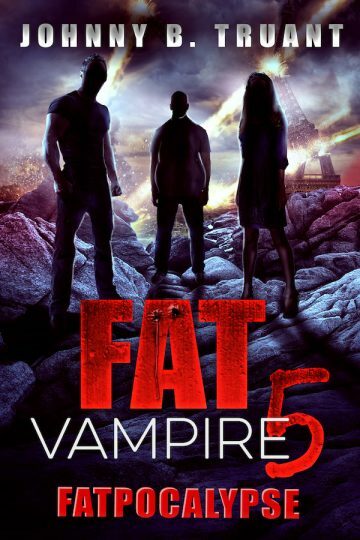 Fat Vampire 5 is the biggest, bloodiest, most snack-filled installment in the Fat Vampire series so far, and sets the stage for the sixth book's epic series-ender — a conclusion so big it’ll shake the human world’s foundations. This fresh twist on the tired old undead myth is the fifth in the Fat Vampire series by Johnny B. Truant — author of many bestselling series including Invasion, The Beam, Unicorn Western, The Dream Engine, Robot Proletariat, and more.